Rather unsurprisingly, Street Fighter 5 will be getting a shiny (and limited) collector’s edition when it releases next year. 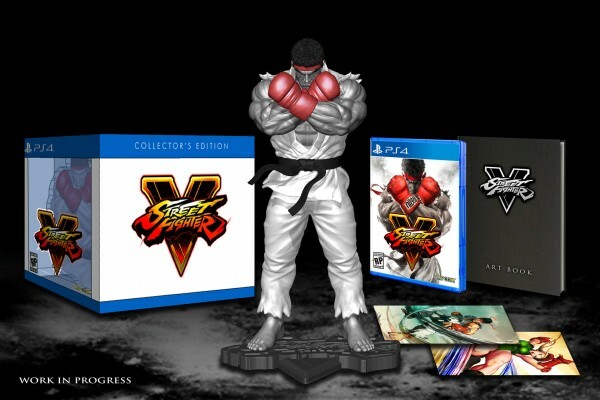 The collector’s edition will give you the game itself (obviously), as well as a 10 inch Ryu statue, a 48 page artbook with sketches behind-the-scenes materials and digital bonuses. The digital bonuses include comics from publisher Udon and a soundtrack sampler. This edition will come out on both the PS4 and PC versions, and will run you $99.99. You can see a preview image of it below. Tagged with bonus, Capcom, collectors edition, pre order, sf 5, Street Fighter 5.